Put the kettle on, sit back and relax in style with this Cambridge Kendal mug. Crafted from high quality fine china, this deluxe limited edition mug features a real gold plated finish which will look beautiful in any setting. With a gorgeous owl design, it is ideal for Christmas and is the perfect choice for curling up with a cup of tea on a cold evening. Easy to use and convenient to clean, it will make a wonderful gift for an animal lover and is guaranteed to look fabulous in any home. This deluxe Cambridge Kendal mug is made from fine china with a smooth gloss coating which looks great and is ideal for everyday use. 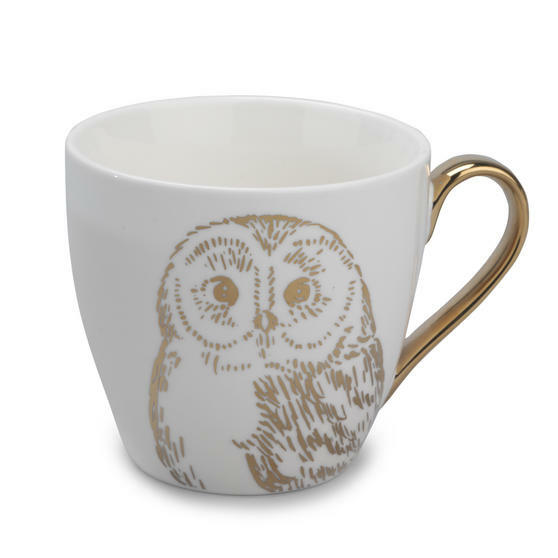 Featuring a gorgeous owl design, it is an ideal gift for any animal lover and is the best way to enjoy a morning cup of tea. Made with the highest quality materials and featuring a real gold plated finish, this limited edition mug is perfect for Christmas. A generously sized 9.4 x 10.2 cm it comfortably holds 350ml, or 400ml if filled to the brim, perfect for when you need a large coffee.